This Nigerian bleach ad gives an idea how people in the region view Obama. Here in the West we know him as a Muslim, there he seems to have a bit more of an esteemed perception. 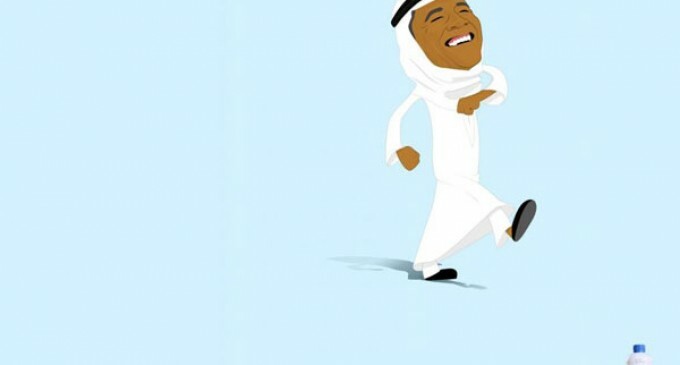 As part of a trio of print ads for Nigerian bleach company Hypo, Obama has taken the form of a Middle Eastern man dressed in a traditional Arabian robe and headdress. With an upturned nose and a wide smile, the two-dimensional figure is pictured marching proudly across the page. Beyond that tagline, the consumer is left to wonder exactly what message the advertising professionals behind the ad hoped to convey. Noah’s Ark, the advertising agency behind the campaign, was not immediately available to comment. Considering both the agency and advertised company are based in Nigeria, it could suggest this is how people in the region view Obama. After all, his frequent odes to the Middle East and poetic praise for Islam have convinced plenty of Americans that his alliance lies elsewhere. His initial support of the Muslim Brotherhood during the Egyptian uprising gained him credibility among protesters in the region. He has arguably lost some of that influence through a series of bumbling missteps since; however, his own autobiography offers numerous ties to the culture. In fact, photographs exist of a younger Barack Obama dressed very similarly to the animated version portrayed in this advertisement. On the other hand, the purpose behind this campaign could be as simple as the driving force of all advertising efforts: attention. The Obama ad is one of three similar pieces, each featuring a famous figure in unusual garments. In the two other ads, anti-apartheid hero Bishop Desmond Tutu is wearing a white robe while clutching what appears to be a Ku Klux Klan hood, while lesbian entertainer Ellen DeGeneres is pictured in a wedding dress. No matter the motives – political or otherwise – behind this campaign, it has succeeded in sparking conversations half a world away. Even advertisers sinking millions into next year’s Super Bowl won’t be able to make that claim.